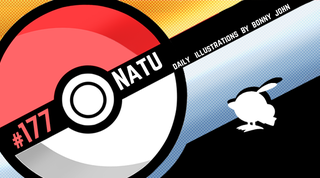 Nimble Natu! Pokemon One a Day, Series 2! Hope you all had a lovely weekend! To kick off the next line up of lovelies for One a Day comes Natu, a tiny little creature with big eyes and a penchant for hopping. I decided to tackle the illustration with a style I can't quite label to anything in particular...I sorta just went for it, it being getting the art done! And I'm quite pleased with this end result! I'm not really sure what happened, but it was a natural process to how I began painting the admittedly simple linework that didn't come about after much thought and planning. 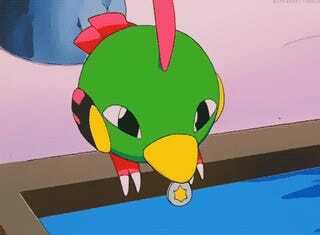 I mean, it's Natu - the creature is tiny and round and that's about it. I guess it was precisely because there was little to work with that I had to create an outlet to try and spruce things up - the way I wrapped colors around the creature with little flourishes in the main body kinda has you looking around the details for a second or two longer. The piece catches your eyes right away because of how colorful it is. The abstract nature in which features of the body are connected yet disconnected also has you looking things over a bit closer. As a psychic type, I enhanced its eyes to be more hypnotic than usual, which are housed in almost an Egyptian themed housing convention. -You learned how to juggle! -You learned how to make balloon animals! -You were put under hypnosis by your clown professor and brainwashed into assassinating the biggest mafioso king pin at a party that the mob threw for his young daughter. being a clown was the ultimate disguise for an assassin. - You recently upgraded your big clown shoes to even bigger clown shoes that squeak!